Has anyone else noticed the size of your bagel getting bigger in the last 20 years? And the amount of cream cheese spread on them seems to be growing too! A standard bagel and cream cheese snack will set you back 450 calories! I'm not sure when a bagel became 3 slices of bread, but it bums me out. Here is a great article I found about the changes in portion sizes Portion Size, Then Vs. Now (scroll down to see the bagel). Snack Girl came up with her own solution to her bagel dilemma. Yes, even in the middle of nowhere, I can find a pretty delicious bagel. My bagel bakery opens at 7 AM and I have been there chomping on warm bagels. The greatness of a bagel and cream cheese is what you put on it. 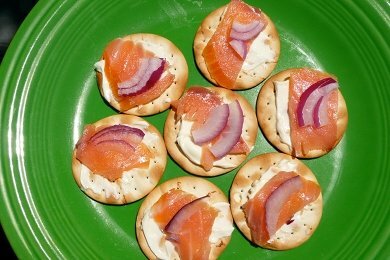 I boiled down the essence of what I desire with just sour cream, smoked salmon, and a tiny sliver of red onion on a cracker. Read the label when you by smoked salmon. I found some at my supermarket with added colors, nitrites, and even corn syrup! Smoked fish should maybe have some salt, but nothing else. Spread a dab of sour cream onto cracker. Place a small piece of salmon and red onion on top. How do you deal with your bagel and cream cheese craving? This makes ten "bagel bites" and you recommend eating THREE! YIKES! Looks good! Here's another work-around: Look for BAGEL THINS in the bread aisle - they are like those new "sandwhich thins" in that they are similar to a bagel, but much thinner and therefore better calorie-wise - you can have 2 sides of this bagel for about 110 calories. It's another great makeover! I also get the Thomas bagel thins for my son. They aren't as good as a traditional bagel but you can eat the whole thing with low fat cream cheese and not feel guilty. My son loves bagels and cream cheese but he already has to watch what he eats so this is the perfect solution for him! Delicious! Smoked salmon is awesome. Are you sure a bagel is "just" 3 slices of bread? Haha. I've heard anywhere from 2 to 5 slices. It's crazy! Who needs that much bread in one sitting? ummm...ok. I'm with ya on most stuff, but seriously? I hate sour cream, and raw salmon will literally make me puke. I don't think red onion on a dry cracker will do it for me. And, even if I substituted, I don't think this can be pulled off as a bagel substitute. My son eats a bagel with cream cheese every morning and if I gave him thi instead he'd laugh at me. I still love you but I don't love this. Mindy ... do you not know that "raw salmon" is called LOX and is smoked, not just "raw". I wonder what part of the country you live in. Sorry, "smoked salmon" makes me puke. I am sorry I called it raw and it offended you to the point that you felt you had to demean me. I wasn't ttrying to offend you, just giving an honest opinion. I am sorry that felt threatening to you. I use Weight Watchers Bagels and Weight Watchers Cream Cheese. Skinny Cow. 1 point per little wedge! Yum!